What's The Rent In Your 'Hood? In New York, the plight of its citizens makes for particularly excellent conversation fodder. Our all-too-common gripe? How much we pay in rent — not to mention the hassle of actually finding a place to live. Zumper, a lifesaver in our apartment-hunting quests, has provided this handy map to show just how much the median rent is in your neighborhood. While all these numbers are still pretty shocking, we at least know if we're getting a fair price for our current digs, and if not, where else we can look to meet our budget. What else does the map tell us? 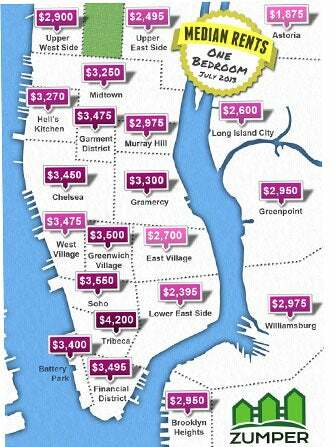 Looks like the Lower and Upper East Sides are the most affordable in Manhattan at the moment, while Astoria takes the cake for cheap rent in the outer boroughs. Plus, Zumper's guide confirms that Brooklyn is getting more expensive than even some Manhattan neighborhoods. Anyone want to take over/under bets on how many hipsters we'll start to see move above 14th street?